The Thirty-Seventh Regular Session of the UN Human Rights Council (Council or HRC) was held at the Palais des Nations in Geneva, Switzerland from 26 February to 23 March 2018. The Council addressed numerous grave human rights situations across the globe in a number of sessions with independent human rights experts, commissions of inquiries, working groups, investigative bodies, and advisory committees. On the 2nd of March an urgent debate was held on the deteriorating situation of human rights in Eastern Ghouta and on the 5th of March adopted an orally revised resolution that requested the Commission of Inquiry on Syria to immediately conduct a comprehensive and independent and inquiry that is to be presented to the Council in its June Session. Three High-Level Panel Discussions were held on Syria on the seventieth anniversary of the Universal Declaration of Human Rights and the twenty-fifth anniversary of the Vienna Declaration and Programme of Action. 91 dignitaries gave a statement during the high-level segment. 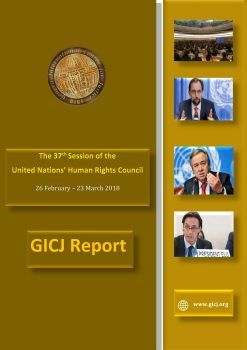 During its participation in the 36th session of the Human Rights Council, GICJ, jointly with other organizations, delivered 24 oral statements, submitted 14 written statements, and co-organized 3 side events. The official copies of the written reports submitted to the Human Rights Council are available to download at the bottom of the page, alongside the summaries and videos of the side events.